Well, I love paranormal especial when there’s a romance thread running through. I’ve not read any of Amanda’s work before (though I can see she’s another series that looks good and might try them when I’ve time and cash! 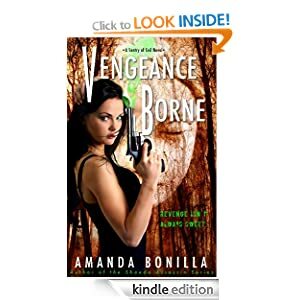 So many books, so little time…) Anyway I plunged in to Vengence Borne, and its one of those where you get straight into the action. Its voiced in third person, and very action and dialogue orientated. I love those, I don’t want pages of description of what’s happened and is going to happen, but need to feel I’m there, in the thick of the action. Jacqueline was someone I immediately felt close to, and I understood her actions and thoughts from the tough upbringing she’d had. Finn….a good looking charmer and – well – he was someone we’ve all met, one of those who think they know best and do what they think is best, but that’s not necessarily what you want them to do. Micah – the mystery man, but I fell for him quickly. Trish, everyone’s favourite grandma or hard hearted practical person? Actually I think she’s a bit of both, and as the series goes on I think we’ll learn more than just the first impressions we’ve been given of these key characters. There’s other people too, brought in for background and practical purposes but these four seem to be the nucleus. Its a great story, gripping, magical, tough and cruel sometimes – well the supernatural world isn’t one for sweet and light people. I really enjoyed it, thought it was well set out, and followed up with tempting glimpses given of what could happen, how they may get through it, and then spanners thrown in to gum up all the plans. It does finish neatly the plots in this book, no horrible cliffhangers, but with the feeling we’ve lots more to come from the gang. Its a cracking finale and a really fun read if you like a spark of humour and romance with your magical witchery and supernatural creatures. Its priced at £2.49 for 380 pages so excellent value and one I’d happily re read. Stars: 4.5 – almost a full five.